Red wood ant Formica rufa, copyright Richard Bartz. 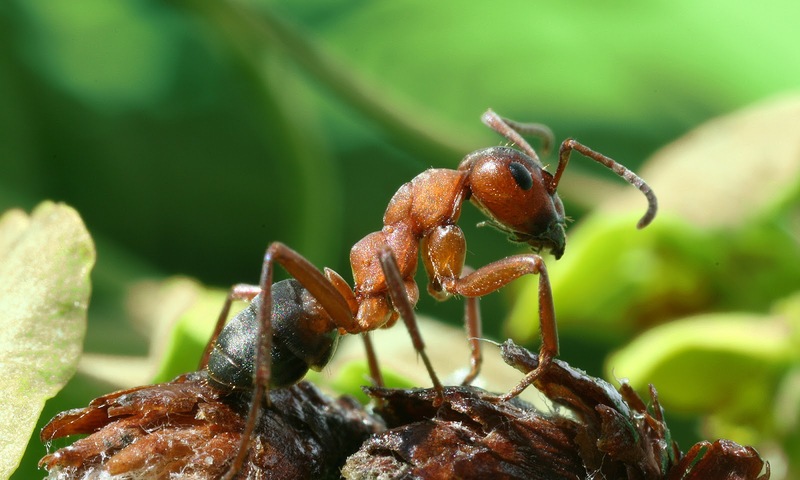 Formica, wood ants, is a genus of relatively large ants found primarily in northern temperate regions. Characters (from Wheeler & Wheeler 1990): Larger ants (2.5–9 mm long); antenna with twelve segments; frontal carina prominent, its lateral margin slightly raised; ocelli conspicuous; maxillary palp with six segments; propodeal spiracle a narrow slit. [HB69] Hirschmann, W., F. Bernhard, E. Greim & H. Götz. 1969. Gangsystematik der Parasitiformes. Teil 75. Zwanzig neue Hypoaspis-Arten. Acarologie: Schriftenreihe für Vergleichende Milbenkunde 12: 133–141. [L1802a] Latreille, P. A. 1802a. Histoire Naturelle des Fourmis, et recueil de mémoires et d'observations sur les abeilles, les araignées, les faucheurs, et autres insectes. Théophile Barrois père: Paris. [L1802b] Latreille, P. A. 1802b. Histoire Naturelle, générale et particulière des crustacés et des insectes vol. 3. Familles naturelles des genres. F. Dufart: Paris. [L02] Lehr, P. A. 2002. Robber-flies (Diptera, Asilidae) of the subfamily Dioctriinae stat. n. (Diptera, Asilidae) of Asia: 2. Taxonomy and ecology. Entomologicheskoe Obozrenie 81 (2): 445–459. [WD04] Wardhaugh, C. W., & R. K. Didham. 2004. The effect of introduced wasp (Vespula vulgaris, Hymenoptera: Vespidae) predation on the dispersive life history stages of beech scale insects (Ultracoelostoma spp., Homoptera: Margarodidae). New Zealand Entomologist 27: 91–101.